Cynthia Guzman was diagnosed with sulfite oxidase deficiency, a rare metabolic disorder, when she was only 6 days old. Doctors predicted she would die within a few months. Seven years later, Cynthia is living in North Salinas and, according to her doctors, is the world’s longest-living sulfite oxidase deficiency patient. She can’t walk or talk, nor can she breathe, swallow or eat on her own. Someone has to keep an eye on her at all times to make sure she doesn’t suffocate on her saliva. Her team of pulmonary, neurology and gastrointestinal specialists at Lucile Packard Children’s Hospital at Stanford have no idea how long she’ll live. Most of the time Jose sits by his daughter’s side, exchanging frequent smiles with her and intermittently giving her chest compressions to help keep her breathing while he cleans out her breathing tube. Jose Guzman talks about life with his daughter Cynthia. Photos by Nic Coury. It’s a common routine at this point. He and his wife, Esther, have cared for their daughter almost 24 hours a day for the past seven years – and it’s taken a steep toll on their marriage, jobs and mental health. Had Cynthia been 70-years-old instead of 7, she could have received services in spades, all covered by Medicare: in-home hospice services, therapy for her stressed out, scared family and what’s called palliative care – specialized treatment that focuses on the pain and ongoing management of serious illness. Until recently, such programs for the 21-and-under set didn’t exist. A chronically ill or dying child in need of immediate care instead took frequent and expensive trips to local emergency rooms, facing treatment in potentially strange surroundings by unfamiliar doctors and nurses. Meanwhile, parents in the midst of the worst crises of their lives were left without a road map on the worst trip imaginable: helping their child die. But in April 2010, things changed for the Guzmans and families like them throughout Monterey County. Lucile Packard Children’s Hospital referred the Guzmans to a program newly covered by Medi-Cal: Coastal Kids Home Care, one-third of a pediatric collaborative that also includes the Children’s Hospice and Palliative Care Coalition and the Jacob’s Heart Children’s Cancer Support Services. Coastal Kids provides the Guzmans with a nurse who’s on call 24/7 to make house visits as needed. “It saves us a trip to the doctor, which is good especially in the winter, cause she gets sick really easy,” Jose says. The program also supplies Cynthia with massage and music therapy, and her parents with in-house counseling from a social worker and a babysitter trained to care for sick children so Esther and Jose can spend much-needed time alone on Friday nights. Esther, shy and with a ready smile, prefers to let her husband speak about their daughter. “We see Cynthia as a gift now, not a problem,” Jose says as he kisses his daughter’s small hand. As of 2010, more than 140 families in Monterey County were dealing with the harsh realities of caring for a child with a life-threatening or life-ending condition. Making a devastating situation worse, state-sponsored home hospice programs require parents and doctors to end all curative treatments under the assumption that the child has no more than six months to live. Lori Butterworth, founder and former executive director of Jacob’s Heart, saw firsthand how detrimental that all-or-nothing approach was for families. In 2001, she took her concerns to her friend Devon Dabbs, a Central Coast documentarian and television marketing executive with film credits including the Peabody-Award-winning CBS documentary, Break the Silence: Kids Against Child Abuse. The women turned their talk into action, and developed the Children’s Hospice and Palliative Care Coalition, a service network similar to that provided by adult hospice, but for children ranging in age from newborn to 21 years old. A report from the Institute of Medicine found that eligibility barriers prevented more than 99 percent of children from getting needed hospice services – and further fueled the women’s fire. Dabbs and Butterworth wanted a way for families to access community-based hospice and palliative care while continuing the hunt for a possible cure. From 2001 to 2005, they pounded the pavement to raise awareness. And in 2006, former Gov. Arnold Schwarzenegger signed into law the Nick Snow Hospice and Palliative Care Act, drafted by former Assemblywoman Wilma Chan and co-authored by former Senate Pro Tem Don Perata and former Sen. Deborah Ortiz. That law allows the coalition to obtain a federal waiver so Medi-Cal can cover a portion of the services the group provides. It also mandated that the state Department of Health Services work with the Children’s Hospice and Palliative Care Coalition to create a three-year pilot program that enables children to receive both hospice and palliative services, while letting them continue to seek cures and life-prolonging treatments. The coalition – mostly funded by grants from the Hospice Foundation, the Community Foundation, a state waiver and private donations – also makes good economic sense. Hospice care costs significantly less than an ambulance trip to the hospital, which can run anywhere from about $650 to $1,000 per trip, and hospitalization, which can cost $2,000 per day on the low end of the spectrum. “It’s only been recently, with all the cutbacks with Medicare, that hospitals started to listen to options that saved money. Palliative care has come to the forefront, using that as leverage,” says Dr. Leslie Foote, a palliative care specialist in Salinas and consultant to the collaborative. Also on the Central Coast, nurse Margy Mayfield had already committed her life to providing home care for terminally ill children – founding Coastal Kids Home Care in 2007. The Salinas agency has since become an integral piece of the collaborative. Previously, when children were sent home from the hospital, there was very little support for their families. If something went wrong in the middle of the night, the only option was to call 911. The child would be rushed to the nearest emergency room and would eventually have to be transported to one of the nine children’s hospitals in California. For Monterey County, the closest children’s hospitals are University of California San Francisco and Lucile Packard in Palo Alto. Only patients with Medi-Cal are currently eligible for the pilot program, and that Medi-Cal waiver could be yanked if the program doesn’t remain budget neutral. At the Children’s Hospice and Palliative Care Coalition office in Watsonville, crayon drawings with words like “hope” adorn the walls, confirming what the program’s all about: helping critically ill children live and enjoy life, no matter how much time they have left. It’s also about helping parents endure, because when parents are asked to stop a child’s treatment, it can make them feel as if they’re giving up all hope. For Nora Bianchi, chair of the Family Advisory Council and director of the coalition’s operations, end-of-life care for children hits especially close to home. When her daughter Ruby was 6 weeks old, Bianchi noticed she’d lost muscle tone in her legs. At the time of her daughter’s illness, the services now offered through the collaborative weren’t available to Bianchi and certainly not covered by any form of insurance. “We were asked to sign over our rights to hospice and walk away from medical options, which is a very difficult thing for a parent to do,” she says. About eight weeks before Ruby died, she began receiving hospice services and she was able to be cared for at home. It made the difference between spending her final weeks in the hospital, or dying in a place that was familiar. “It was a life-changing experience, and after 10 years I was ready to work for children’s hospice and share my story,” Bianchi says. “It’s a gift to have a child who brings your whole focus into what’s most important for you and your family. I look on it as the greatest gift I could have been given, to walk that path with her. Even with the federal assistance to Medi-Cal, adequate funding continues to be a challenge. Medi-Cal pays a flat fee to Coastal Kids for every patient visited. But Mayfield says the reimbursements are about $70 short, on average, and the rest has to be made up through grants, private donations and fundraisers. Meanwhile, Medicare covers full costs for adult patients to receive the same basic health care. For Coastal Kids’ first three summers, Mayfield worked without pay and took out a second mortgage on her home. It wasn’t until January 2011 that Mayfield and her employees were able to receive medical benefits of their own. And money is still tight. 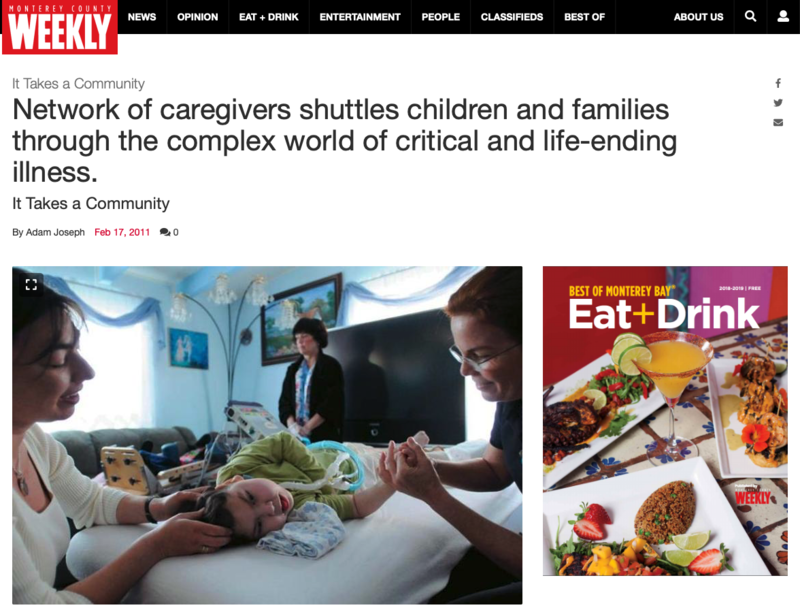 Cynthia spends most of her time in a miniature mobile hospital bed in the Guzmans’ den, which looks like an ordinary family gathering spot with a television, puffy couches and family photos on the walls. She’s all smiles, and communicates with her left hand, which is covered with a fuzzy red glove to keep it warm. The Guzmans are as prepared as they can be, knowing that any given night could be their daughter’s last. But they have peace of mind knowing she is able to live with them comfortably and have the necessary support just a phone call away. A couple weeks ago, Cynthia had a bladder infection and Coastal Kids treated her in her own home. It’s a simple luxury the Guzmans didn’t have a year ago. The sight of Cynthia’s smile and the ability to care for her at home helps the Guzmans get through the day. But it’s how she goes, when she goes, that may leave a sense of peace.